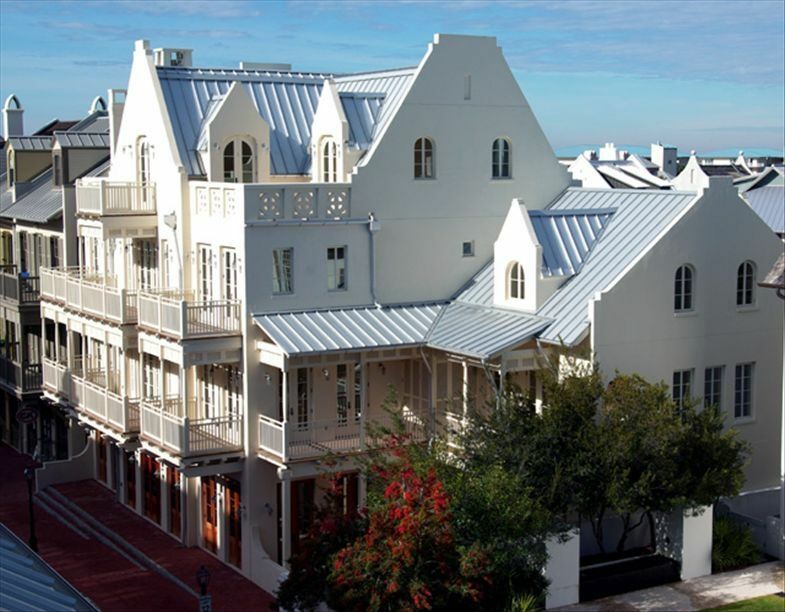 Located on the south side of Highway 30A in the heart of Rosemary Beach, The Soleil is the most stunning building on Main Street. With unobstructive Gulf views from each available unit, European style architecture and town center location, The Soleil is sure to be one of the most sought after vacation rentals in Rosemary Beach. Step into the sun and enjoy the warmth that Rosemary Beach has to offer. Unit 3A is a two bedroom, two bath, two level condominium with approximately 1194 square feet of interior living space exquisitely furnished by nationally renowned Lovelace Interiors. The unit also boasts 514 square feet of outdoor living to enjoy the warm breezes, views of the Gulf and Rosemary Beach. The living and dining room are decorated in electric blue and tan fabrics, rich black wood furnishings, distinctive artwork, and delightful accessories. The main living room showcases a cozy gas fireplace, built-in media cabinets and doors that open out to the front facing balcony which is a wonderful place to enjoy the sunrise and gulf views. The living and dining area are open to the well equipped kitchen providing for great entertaining. The lovely guest bedroom with private bath and balcony finish out the first level. The second level showcases the master bedroom suite. The light filled master bedroom features gorgeous finishes, unique artwork, and a private well appointed terrace with stunning views of the Gulf, perfect for relaxing with a cocktail from the handsome bar. The master bath boasts an enormous shower, dual vanities, extensive closet space, and a private balcony with a Jacuzzi spa. The unit features keyless entry/access, travertine tile throughout, granite countertops, impact rated windows and doors, elegant beach chic interior design, Heavenly Beds, flat panel televisions, wireless internet, washer and dryer, and reserved parking. Enjoy all the amenities that Rosemary Beach has to offer from four heated pools, eight clay tennis courts, fitness center, playgrounds, and nine deeded beach walkovers. The Soleil also offers complimentary beach chairs for the length of your stay to enjoy our beautiful beach. Our favorite stay in Rosemary Beach....fabulous location, fabulous unit inside and out! Well appointed with no detail missed: kitchen necessities, housekeeping supplies, satiny soft sheets, fluffy towels, luxury toiletries, and even complimentary beach towels from the impeccable Soleil Management. Our rental manager, Carrie Ellison, took wonderful care of us. She was accommodating and super friendly...she even stopped by to provide additional parking passes and went the extra mile to have beach chairs set up for our guests. The photos of this unit online are nice, but experiencing the space in person is much better. With two bedrooms laid out on two levels and balconies/patios accessible from every room, it's a perfect spot for couples or small families to gather and have a relaxing fun trip. The finishes and furnishings are clean, crisp, and beautiful. The master bedroom feels like a sanctuary with an extra large shower and walk in closet. The master bedroom boasts two patios: the front patio facing Main Street has a dining table and chairs for enjoying breakfast. The back patio, more private, has a large hot tub perfect for enjoying the stars and relaxing... fabulous. Can't say enough nice things about this unit, a truly enjoyable stay! I look forward to our next visit in the spring of 2014, reserving this same unit of course! My husband and I had a fabulous stay at The Soleil with our two teenage daughters. The location and accommodations were excellent. We had breakfast every morning on the balcony where we could see the ocean. Main Street gets pretty quiet by 10 pm so we had no night owls to disturb us. The management was 5 star quality and we loved all the amenities--what a treat! Absolutely no complaints and we would definitely stay here again! My girlfriend and I had the pleasure of staying at the Soleil in May. We had the best time! I have rented in Rosemary with my family for years. We have stayed in homes, The Savannah and at the Flats. The Soleil is by far the best place I have stayed for an adult vacation. The pictures do not do it justice. It is just beautiful. It was spotless and quiet, yet so convenient to the restaurants and shops. There are multiple balconies which was so nice. We sat out on the rooftop balcony one evening and listened to music and had cocktails. Another night we sat on the balcony overlooking the main street and watched people while listening to a band from a wedding which was taking place just down the street on the green. The room layout was very convenient. One is on the main level while the master is upstairs which allowed us to have our own bathrooms and privacy. The amenities were fabulous. Soaps, shampoo and lotion from Pish Posh Patchoulies, nice thick towels and incredible linens on the bed. Jeanine took amazing care of us! She greeted us and made sure we had everything we needed. It was so nice to have beach chairs from Sea Oats waiting for us each morning and bikes downstairs to use at our convenience. All in all just a wonderful trip! In fact, we will definitely be going back this fall with our husbands. I can't wait! This is our second time for our family to stay at the Soleil and we love staying here. Jeanine the manager of the property goes the extra mile. She always greets us upon arrival and leaves a goody bag w/ towels and dinner certificates and even showed up with Easter baskets for my daughters. The Soleil is a beautiful facility with luxury linens and appliances. It always is stocked with all the necessities and is located conveniently to walk to the beach and dinner. Jeanine also has bikes for your use as well as beach toys for the kids. It is always hard to leave. We will rent from her again. Our recent stay at the Soliel was wonderful! Our accommodations were as advertised and can't be justified in the pictures. We were assured that should there be any issues with the oil situation, we would be refunded without any issue. (6/8/10 thru 6/12/10) Without mentioning names (per the instructions above) we were met in person and tended to with 5 star treatment. All of our needs were taken care of and the extent to which our booking agent went to make our stay a great one, is an exceptional value in it of itself. The details that were managed and presented were exceptional. The combination of fantastic customer service along with the magnificent property and its surrounding amenities makes it certain there will be a return visit. THANKS JH!! Without exception the nicest place to stay with the best service in RMB! We have visited Rosemary Beach many times now and I can't see us ever renting anywhere other than the Soleil again. The service is perfect, the location is very convenient to the pool, beach, and restaurants, and this condo is beautiful and clean. This is by far the nicest rental we have found! Can't wait to come back! La Cremas, Onano, and Cowgirl Kitchen are right downstairs and Gigi's is a must to checkout if you have kids!